Whether it’s still photography, or video, the Nikon D850 promises stunning results, due to a dazzling combination of features that make this one of the best-reviewed cameras in the DSLR market. Nikon describes the resolution as "extraordinary", and the dynamic range as "outstanding". With a 45.7-megapixel full frame sensor, it seems these superlatives are justified, and the Nikon D850 can be seen as a big step up from other top-end cameras in the Nikon stable. The D850 has some impressive performance statistics as well, with up to nine frames per second of continuous shooting, at full resolution and with full AF performance. This is video footage for the new age, thanks to the camera's 4K Ultra High Definition recording capabilities. Time-lapse is a feature being built into more and more cameras, particularly at this end of the market, and the D850 is no exception, with 8K and 4K time-lapse movies promising sharper, more detailed results than ever before. 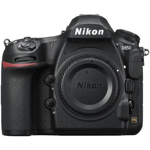 There are developments in pretty much every area, jumping ahead of its predecessors in Nikon's 800 stable to make this a much sought-after camera for serious photographers. Nikon talk about "remarkable advancements across the board", including sensor design, dynamic range, shutter and mirror-drive mechanisms, Silent-Photography in Live-View mode, and, crucially, battery life.